The Reds have enviable outfield depth. Beyond a solid starting trio of Billy Hamilton, Adam Duvall, and Scott Schebler, top prospect Jesse Winker is banging down the door. Winker was superb in a 137 plate appearance trial – enough so that, despite hitting 30 home runs, Schebler’s job is in danger. Winker has only one serious drawback – he’s a ground ball hitter with middling power. He is a high floor, modest ceiling hitter whose profile is helped by his ultra-friendly home park. Next in line after Winker is Phillip Ervin. The 25-year-old righty profiles as an ideal fourth outfielder, capable of filling in at center field in a pinch or carrying the light side of a platoon. With the right opportunity at Great American Ballpark, Ervin could supply serious fantasy value. His path to playing time is obviously quite tenuous. He may start the season in Triple-A where he can continue to hone his approach at the plate. Scouting reports complain of issues with his swing. Here’s an excerpt from our own Eric Longenhagen (circa January 2017). His lack of bat control and the general stiffness in his swing make it hard for him to make quality contact, and he hits lots of pop ups and weak fly balls. His breaking-ball recognition and patience help him hunt pitches he can drive, but Ervin doesn’t square much up. Those same issues showed up in his 64 plate appearance cup of latte. Behold, a chart courtesy of Baseball Savant. 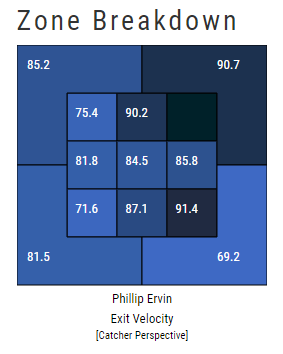 Ervin barely had average bat exit velocity in any region of the zone. He posted a meager 22.7 percent hard hit rate with 20.5 percent soft contact. That’s nearly an exact match for Ender Inciarte. And while Inciarte boosts his average with plenty of contact, frequent line drives, and high value ground balls, Ervin is a fly ball hitter. We’re not talking good fly balls either. Throughout his minor league career, he carried over a 25 percent infield fly rate. While it’s important to note that we’re working with very small sample data, the results match the scouting reports and minor league track record. He’s likely to give away over 30 percent of his plate appearances in the form of a strikeout or infield fly. His ability to do something with the remaining 60 to 70 percent will determine his fantasy and real world value. Prior to 2017, Ervin was considered a highly patient hitter. He seemingly opted to take a more aggressive approach last season with mixed results. We still have every reason to expect well above average plate discipline, although opposing pitchers are likely to challenge him due to the high soft contact rate. That could work in our favor. If his opponents are aggressive, that means more middle-middle pitches. Combined with his fly ball tendencies, home park, and “juiced” baseballs, a 25 home run pace could be within reach. And if pitchers instead opt to approach him more carefully, a healthy OBP should follow. Remember, per Longenhagen’s report, Ervin has good breaking ball recognition. If he has an exploitable hole in his swing, it’s probably against hard fastballs. The Reds like to create mayhem on the bases, and Ervin will fit with their philosophy. While his speed only grades out as a 50 or 55 on the 20-80 scouting scale, he has a long history of running with a solid success rate. With regard to his base running, I’m reminded of Michael Brantley – another guy who makes the most of merely average speed. Ervin will need some outside help if he’s to receive regular playing time. A couple injuries or serious regression from Schebler could open the door. To keep the job, he’ll need to demonstrate his best blend of power, on base skills, and speed while avoiding infield flies. It’s a long shot to work which means that we can file Ervin under “to watch” in all but the deepest dynasties. Just be ready to take a flier when his circumstances change. We hoped you liked reading The Reds Other Outfield Prospect by Brad Johnson! I don’t think there’s any reason to believe that Ervin suddenly became an aggresssive hitter in 2017. His swing rate of 40.9% was still quite low. He just walked less because he was facing better pitchers than he was before.